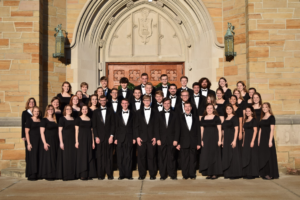 The Grove City College Touring Choir, under the direction of Pro­fessor of Music, Dr. Katherine Mueller, is a select group of forty-four singers. They will come to sing at College Baptist soon. Courtesy. 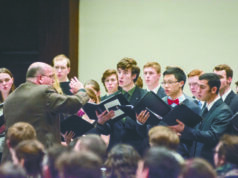 Grove City College Touring Choir will stop at College Baptist in Hillsdale for a free per­for­mance at 7 p.m. Feb. 27. The choir will travel across the country, across genres, and across cen­turies as part of their annual spring break tour, per­forming pieces as diverse as Palestrina, a Brahms requiem, and Moses Hogan. Hillsdale assistant pro­fessor of music Derek Stauff, an alumnus of Grove City College and the choir, was instru­mental in coor­di­nating the visit, which is a small-town stop on their trip to and from Chicago. Stauff then began calling up local churches to find housing for all 45 stu­dents. 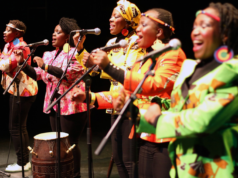 The choir per­forms at a dif­ferent church almost every night of the week-and-a-half-long tour, Kurak said. According to Stauff, the concert is a win-win sit­u­ation for all who enjoy the Grove City choir’s music. 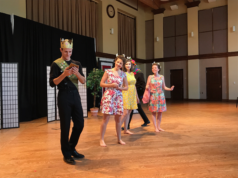 “They come and do the concert for us, we provide them with a meal and housing for the night, take in a couple stu­dents per family, and then they’re on their way next morning to their next concert,” Stauff said.